From January 15, 2019 to April 30, 2019, you can earn up to a $300 cash bonus or 1,000 AIR MILES reward miles when you open a new Canadian Dollar Primary Chequing Account at any BMO branch or on bmo.com. 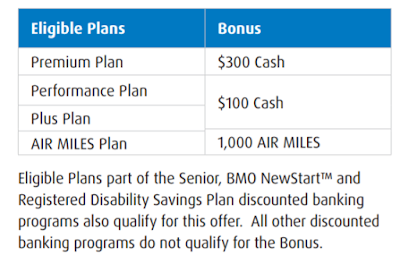 Eligible Plan (the ‘Eligible Plan’) (see below) at any BMO branch or on bmo.com by April 30, 2019. 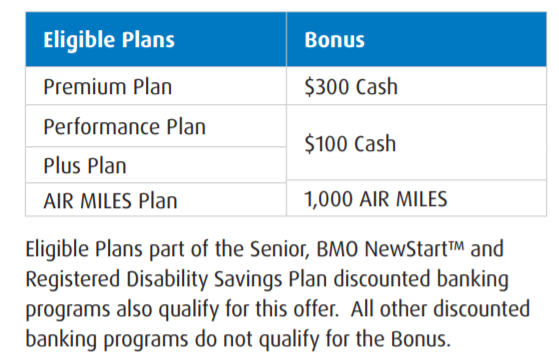 Eligible Plans part of the Senior, BMO NewStart and Registered Disability Savings Plan discounted banking programs also qualify for this offer. All other discounted banking programs do not qualify for the Bonus. 2. Make a deposit of any amount to the Lead Chequing Account by April 30, 2019. 3. Set up one (1) recurring direct deposit into the lead Chequing Account and have at least one direct deposit transaction posted to the lead account by May 31, 2019.